My name is Dixya from Food, Pleasure, and Health and I have a major obsession for all things pumpkin-related . However, this year I am trying to branch out a little bit and give well deserved love and attention to apples. Recently, I attended a cooking class at Sur La Table and learned how to make an apple crostata (which I am not a huge fan of in general) but I loved the spiced apple mix prior to baking. 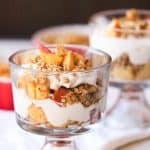 It’s something about the crunchy texture of apples, warm cinnamon + tart flavor – I knew I had to come home and turned them into a parfait. 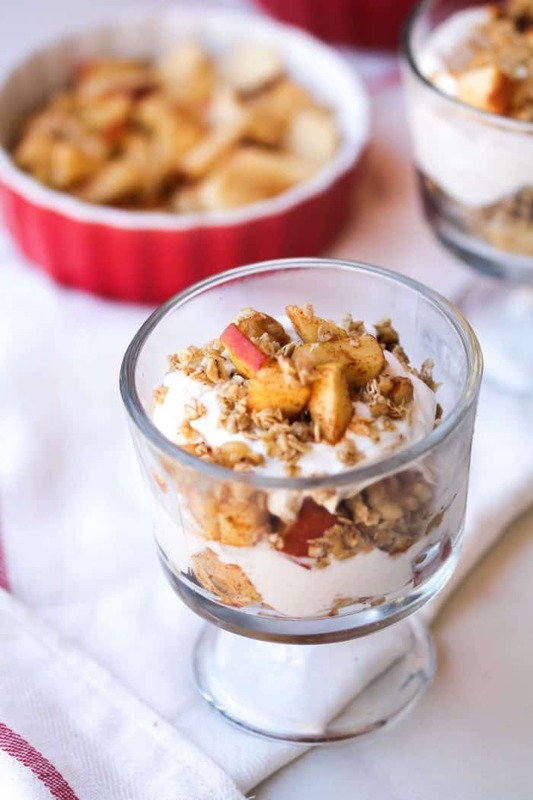 You can enjoy apple pie parfait as a quick breakfast, mid-day snack, or even as a dessert. The boyfriend and I love parfait, especially in the morning because it’s filling, super easy to assemble, and portable if needed be. The best part is you can buy or prepare all the ingredients ahead of time so you have absolutely no reason to skip your important meal of the day. 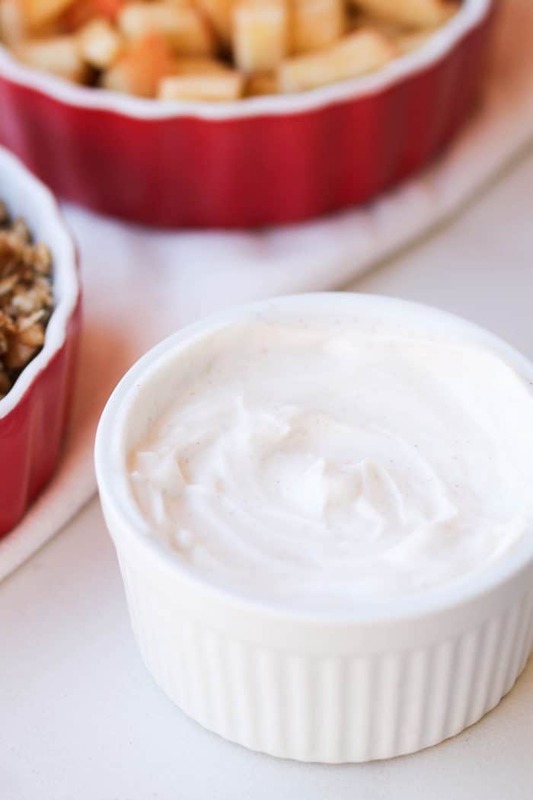 Yogurt – I prefer thick, plain-Greek yogurt for additional protein, whipped with very little cinnamon and honey. Instead of flavored yogurt with a ton of added sugar, I always recommend getting the plain-kind and using actual fruits or little honey to add sweetness. Apples – Chopped apples into small pieces and spice them with cinnamon, lemon juice, brown sugar to give that apple pie flavor. Adding lemon juice adds a little tartness which I like & it also helps prevent apples from browning. This really helps if you are preparing it ahead of time. If the apple you are using it is already tart, I’d skip the lemon juice. 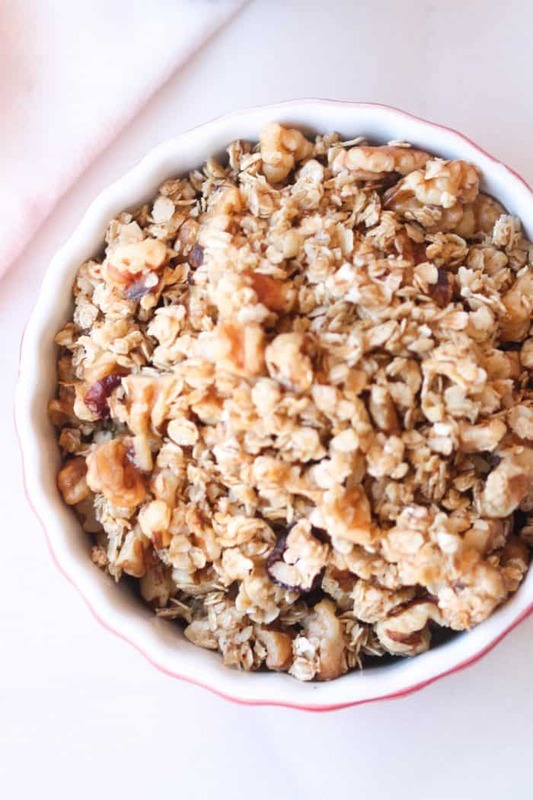 Granola – If you’ve never tried making your own – do it and stop paying all that $$$$$$. My stove top granola is my go-to and I can easily vary nuts, spices, and seeds depending upon what I have on hand. For the apple pie parfait, I simply spiced it with cinnamon and pecans and skipped everything else. Pro tip : I have found that storing granola in the refrigerator keeps it crispy and fresh. If sweet parfait isn’t your thing – I have a savory version that is perfect as an appetizer. I hope you are as enthusiastic about apples as I am this year…Two years ago, I made slow cooker apple butter, apple butter muffins, and have used them in salads but other than that, I have no idea what else can I do with apples? Your ideas are welcome! Are you looking for a simple snack idea infused with Fall flavors? 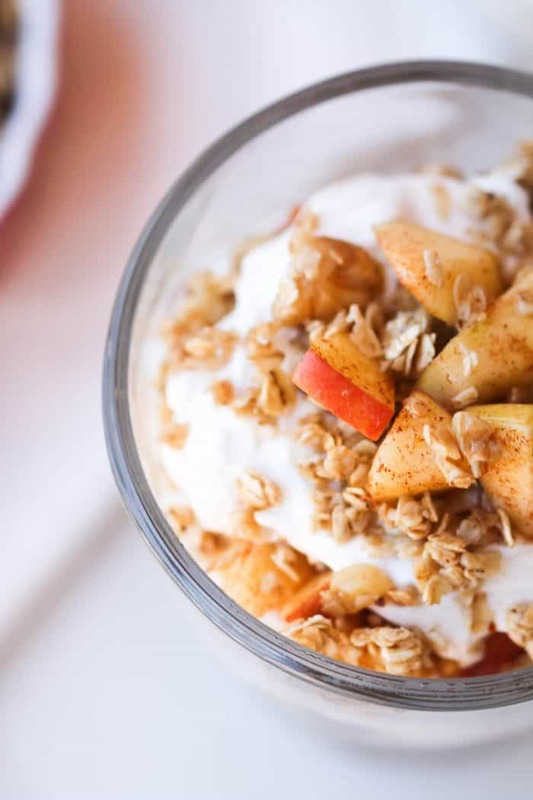 An apple pie parfait for two is the perfect healthy snack idea. In a small bowl, whip yogurt with cinnamon and honey. Keep it aside or refrigerate it until needed. 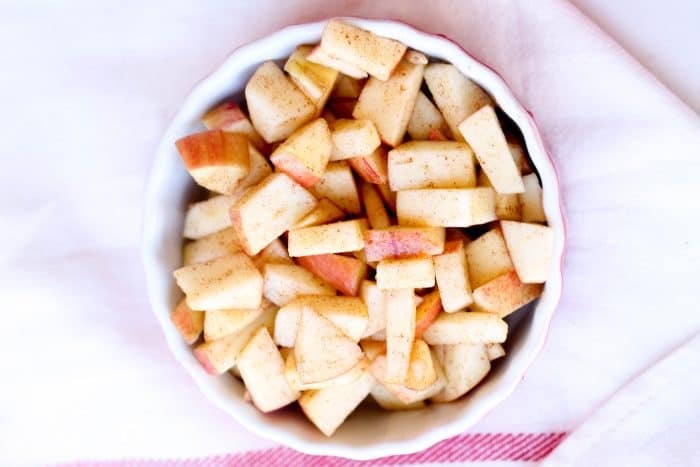 In another bowl, toss chopped apples with brown sugar, cinnamon, and lemon juice. Keep it aside or refrigerate it until needed. 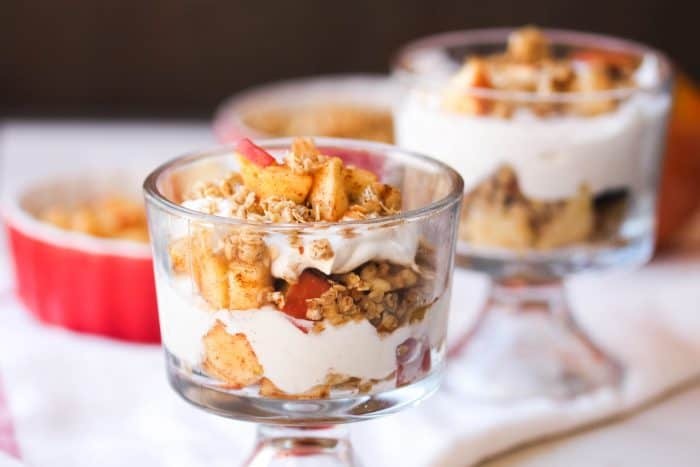 Line a tall glass or a wine glass with a 2 tablespoon of yogurt, 1-2 tablespoon granola, and a small handful of apple mix. Repeat the process. For more wholesome, easy recipes & nutrition rants – find me on my blog www.foodpleasureandhealth.com // Instagram // Pinterest // Facebook. And for my daily randomness and fur baby – I snap under dixyab.